To tell the story of Christ from the point of view of the only female member of the team sounds like an exciting and potentially illuminating idea. It could even have turned out to be as controversial as Scorsese’s “The Last Temptation of Christ”. But Garth Davis’s film, written by Helen Edmundson and Philippa Goslett, while perfectly workmanlike (or should I in this case workwomanlike?) fails to throw any new light on the Christian story or Mary’s relationship with Christ. Most of the mentions of her in the bible are to do with the climax of the story – the crucifixion and the resurrection – so the writers have to use their imagination for the rest, which they have done quite competently. 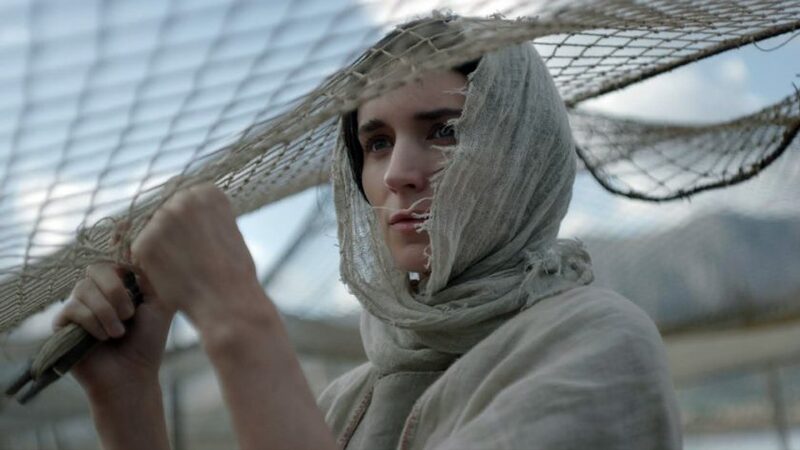 Mary (Mara) is a good Jewish girl, living a simple life with her family, working at the fishing nets and sheep tending and also acting as the community’s midwife. She shows a certain amount of spirit in her refusal to marry and more rebellion when Jesus (Phoenix) comes into her life and she leaves home to follow him. The film carefully avoids any suggestion of impropriety between her and her master – their interaction largely consists of quiet conversations, where she asks questions and he gives not very enlightening answers. And the now discredited mediaeval idea of Mary Magdalene being a reformed prostitute is thankfully out of the window. She is permitted to do a few baptisms – women only though – and is also a witness to the resurrection of Lazarus and the overthrowing of the moneylenders in the temple. But many of the high spots of previous Christ story movies are not here – the mock trial, Peter’s denial of Christ and so on – presumably because Mary has no role in them. Mara, with her still beauty and questioning eyes, is good casting but for most of the film her role is reactive rather than proactive. Phoenix’s Jesus, a shaggily bearded, hippyish and sometimes wild eyed creation, is an interesting contrast to the conventional depiction of the role. But their relationship is disappointingly lacking in any dynamism. The most interesting characterisation is that of Judas (Rahim), a naïve young enthusiast, whose betrayal stems from his belief in the miraculous powers of his leader and has nothing to do with thirty pieces of silver, while Ejiofor as Peter has little to do except be a touch condescending to Mary. Ironically the story doesn’t really come to life until the crucifixion and its aftermath, where Irit Sheleg as Mary the mother of Jesus is particularly moving. What is lacking is any real sense of what it must have been like for a young Jewish woman of that time, conventionally raised to be submissive, having to cope with living in an exclusively male, nomadic environment and the conflicts this must inevitably have created. The only time we get any sense of Mary’s feminine power is towards the end, when it appears that she is the only one among all those men, who understands that the true message of Christ is one of peace and love. If the character had been given more opportunity throughout the film to demonstrate the strength of her feminine perception, it might have led to the interesting speculation in our minds of how different the history of Christianity might have been had Mary been the rock on which the church was built. As it is we have a story, which is slow, stately, reverend, inoffensive and unfortunately rather dull.